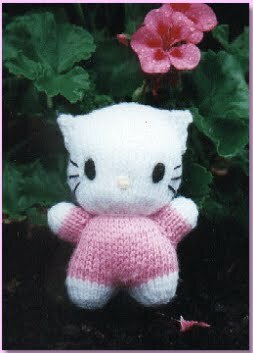 Knit on 3mm double-pointed needles using small amounts of pink, white double-knitting wool also requires tiny amounts of black and pale yellow wool for embroidering the face. Use polyester fibre-fill for stuffing. Break off yarn and leave stitches on a spare needle. Work 2nd leg in same way. Break off white yarn and join on pink yarn. Join row ends from top of head as far as the coloured threads, leaving a large gap in the back of the head seam. Join row ends of each leg from coloured threads to cast on edges. Gather round the cast on edges, pull up tightly and fasten off. Turn right side out. Stuff legs, body and head. Do not close gap in head seam. To shape neck, use a double strand of white yarn and gather around first knitted row of white head. Pull up tightly and secure. Sew yarn ends into neck. Position and sew ears to sides of head so top of ear is level with top of head. Join row ends, turn right side out and stuff. Sew open cast on edge to sides of body, just below neck. For facial sts start and fasten off wool securely in the gap at the back of the head. When face is completed, add more stuffing to hide the ends, then close the gap in the seam. Postion eyes so top of eys is 10 rows above neck shaping and leave 10 sts between eyes. Embroider 4 horizontal sts in pale yellow for the nose, with top of nose 7 rows above neck shaping row. For whiskers, work three 1 cm sts beside each eye, leaving 2 sts between the side of the eye and the start of the whiskers.